Mandevilla sanderi 'Sun Parasol Crimson' is a new Mandevilla available on the market today. Mandevilla are native to Tropical America where they where once known as the genus Dipladenia. It is a fast growing, twining vine with dark green oblong-ovate leaves. Vines will reach 6-8 feet (1.8-2.4 m) tall, but need to be trellised for support. The new varieties like the Sun Parasol group will bloom non-stop from spring until fall. I have been impressed with the growth and flowers of this variety. They are great plants for containers and if you live in USDA zone 10 they are evergreen in the landscape. Blooming: Plants will bloom from spring until fall. Its crimson red flowers with a glowing yellow throat are very showy. Individual flowers will be up to 3 inches (7.6 cm) across. 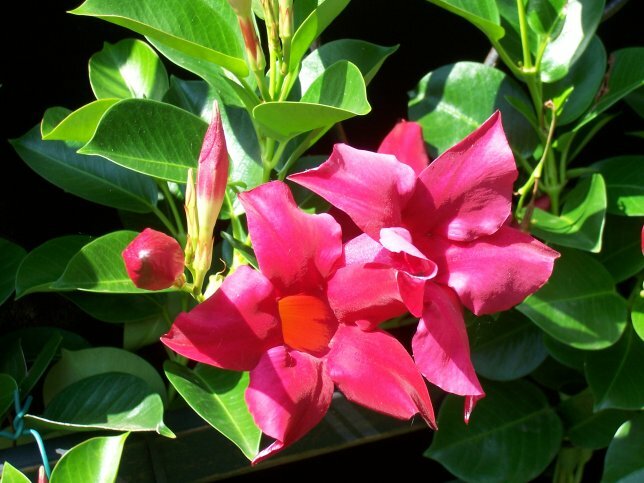 Culture: Mandevilla sanderi need full sun to light shade with a moist well drained soil mix. We use a soil mix consisting of 2 parts peat moss to 1 part loam to 2 parts sand or perlite. The plants are watered regularly and should be kept moist, but not overly wet. If the lower leaves start turning yellow, then the plants are too wet. We fertilize monthly with a 15-30-15 fertilizer. Although plants overwinter outside only in zone 10, they can be grown as houseplants during the winter months. As long as nighttime temperatures stay above 50° F (10° C), the plants will grow well. During this period, they will need bright indoor indirect lighting. Water should be restricted to account for the lower light and cooler growing conditions. Fertilizer will not be needed during this period. Propagation: Mandevilla sanderi can be propagated from cuttings and simple layers at anytime of the year. Mandevilla sanderi 'Sun Parasol Crimson' was featured as Plant of the Week June 27-July 3, 2008.